Titanium is often thought of as the strongest metal in the world. This is not true. Titanium has one of the highest strength to weight ratios. Some steels however are stronger than titanium, such as various stainless steels and alloy steels. Titanium is a very popular metal to use in producing titanium rings and this is one element that is known by virtually everyone these days. Titanium is a chemical element with a symbol of Ti and it’s atomic number is 22. Titanium was discovered in Cornwall in 1791 by William Gregor. He found a strange black sand deposit by a stream that was attracted by a magnet, which in turn perked his curiosity as to exactly what it might be. It’s a lot more common than you might think as virtually all living things, rocks, soil and water contain traces of titanium. Titanium, as well as being light and strong is also not easy to corrode. So, the main positive factor in using titanium is that it can be used as a strong metal in products but without the weight of say steel for example with anti-corrosive qualities to boot. In its alloyed form it is often used in space craft, helicopters, jet engines and missiles. It is also now commonly used in body piercings and jewellery, as titanium is an inert element that does not cause skin irritation. Tennis rackets, bicycle frames, wheelchairs, crutches and crash helmets also take advantage of its light weight / strength properties. In desalination plants, titanium is used in heat exchangers as this metal does not corrode in sea water. In fact, it is nearly as resistant to corrosion as platinum is. Most of the titanium extracted from the earth is refined into titanium oxide TiO2, 95% in fact, which is used to colour paper, toothpaste and plastics. Titanium rings are becoming increasingly popular now. They are a relatively new concept, as they only became widely available in the 1990s. 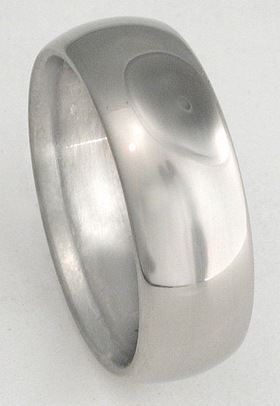 You can have a ‘commercial pure’ titanium ring that is 99.2% pure and classed as ‘aircraft grade’. Titanium is harder to cut than gold, as gold is more malleable, so getting your ring re-sized isn’t a simple matter. It can be hard to find someone to re-size a titanium ring and there is a limit on how much you can re-size a titanium ring. Frost titanium rings: Giving the ring an appearance as though it’s just been taken out of the freezer. Sable: This style gives the ring a silk-like quality. Mokume-gane: A woodgrain type of effect achieved with Japanese samurai sword making techniques from the 17th century, but with the ease of modern production techniques being employed instead of being hand-crafted. Classic: Usually just a shiny, smooth ring showing the beauty of this interesting metal. The hype around titanium creates the illusion that it is a rare metal. However, this metal is abundant in the Earth’s crust, making it the ninth most abundant element contained within the Earth’s crust. There is 0.63% of titanium present in the Earth’s crust and when you consider how big Earth is, then you can get an idea on how much titanium there is available. Total world reserves of titanium is thought to be at around 600 million tons. Titanium is also contained within the Sun, M-type stars and even the Moon. In all, this metal is the strongest metal when comparing weight to strength ratios and has valuable anti-corrosive qualities. The fact that people are using titanium jewellery, such as wearing titanium rings, shows that people are appreciating the beauty of this element more than ever. Click here to find out about the toughest metal in the world.